Hello everyone! 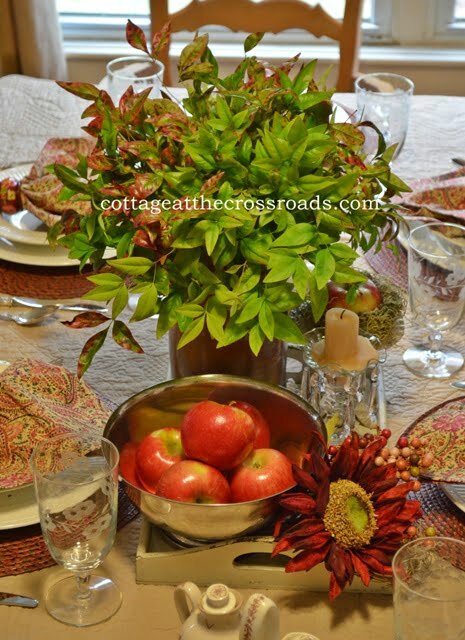 Today I created a fall tablescape using one of my favorite fall things-apples! I recently bought these Honey Crisp apples, and they are not only delicious to eat but they are beautiful, too. After looking at them for a day or so, I thought I’d feature them in a centerpiece for a tablescape. I started by using a quilt that I have had for a long time as a tablecloth. 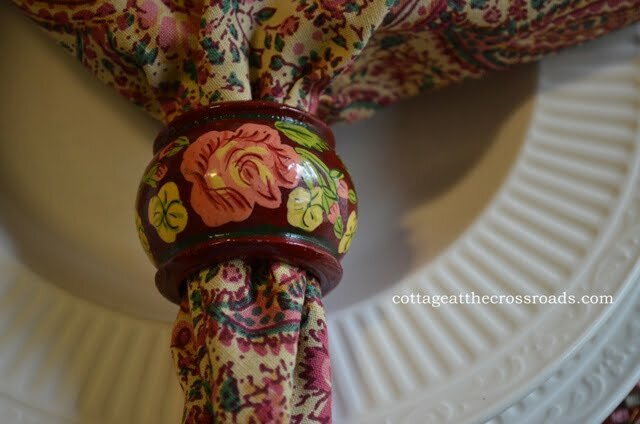 The color of the quilt coordinates with these round placemats and napkins that I had picked up at HomeGoods in August. As I was pulling out my things, I found these April Cornell napkin rings that I bought in Charleston, SC about 12 years ago. Love the colors in them! I decided to use my everyday china which is Italian Countryside by Mikasa. In the same drawer as the napkin rings was this oil and vinegar set that had belonged to my mother-in-law, Sarah Windham. After googling it, I found out it was made in Japan by Ucagco during the 1940s and 1950s. The pattern is called Royal Vista. Along with the oil and vinegar cruets were some salt and pepper shakers. There was also a jam jar with a little spoon. I have read that the pattern is sometimes called Fairy Tale Castle, and I am smitten with it. I’m wondering where my mother-in-law got this set. I do know that my father-in-law was in the Navy and served in the Pacific during that time period. If anyone in the family knows anything about this china, please let me know. 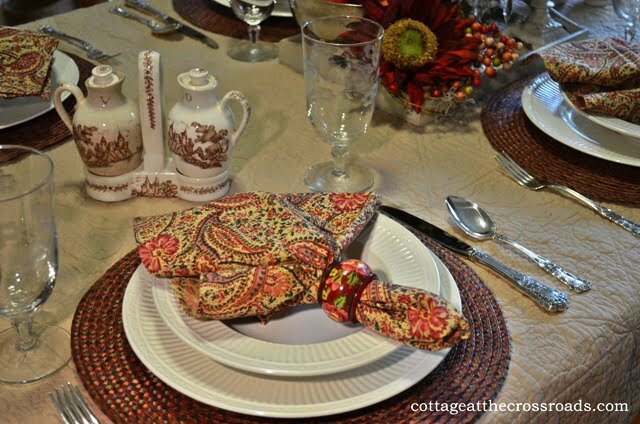 For the centerpiece for the table, I placed a doily in the bottom of a wooden tray. The doily is oval shaped, and I just received it yesterday. I happened to be one of the lucky winners of a fantastic giveaway by Deborah from Fairfield House. You can see all the other things that I won by clicking HERE. The white pedestal that the single apple is in came from Deborah, too. I know some of you are already enjoying some beautiful fall foliage, but here in South Carolina the leaves are still green. But I did find a little color in the yard for the centerpiece. This is nandina which is beginning to turn color. It is really pretty in the fall. These goblets belong to my mother, and I have always loved the etched design on them. Our table is a harvest table and a long one at that. It seats 8 people, and there have been a few times that we’ve gotten 10 people around it. I love all the “harvest” colors on it today. Autumn is a beautiful time of the year, wouldn’t you agree? Thanks for joining me around our fall Harvest Table today! Love, love your table. You can really put it together. Can’t wait for our art class on Sept. 11. Beautiful table, Jane. I think nandina make a great centerpiece. Love the napkins and napkin rings. This is so pretty! I think you chose all the right combination of colors so well too. 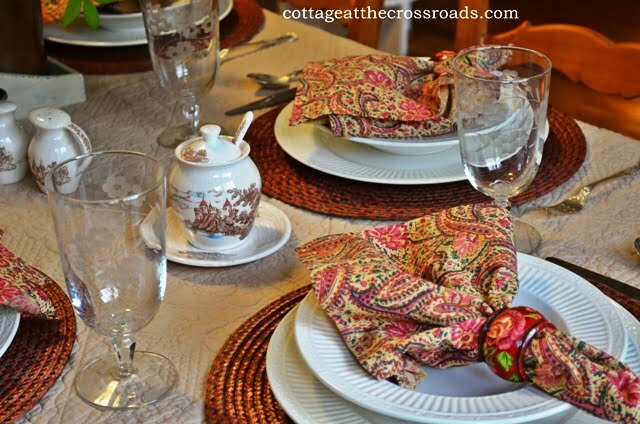 I really like the paisley napkins and the quilt as a tablecloth. But, I also really love how well the specks on the centerpiece leaves just seem to pull it all together. Beautifully done! The condiment set is darling!! I really like your candleholders also. Beautiful table! Your little jam pot and shakers are perfect for this cozy table! 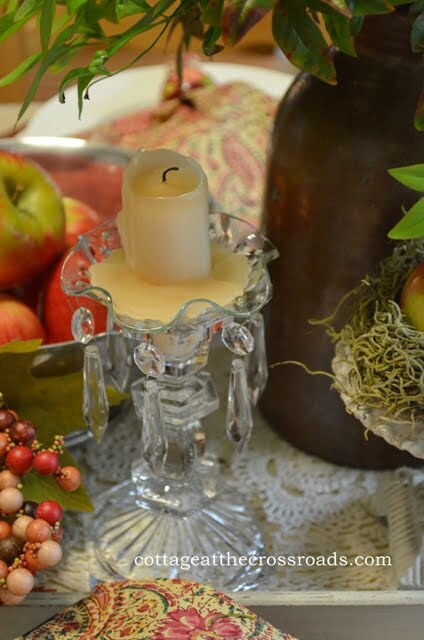 Don’t you just love table dressing in fall? Beautiful! Oh Jane! I think you’ve outdone yourself. This table is so lovely it should be in a magazine! 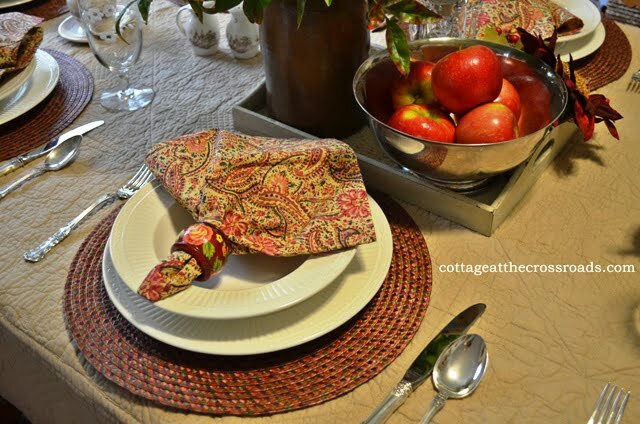 I just love using quilts or other unexpected things as tablecloths. Now you should be entering your county fair table setting division too! The first thing that caught my attention was the apple nesting in the compote which is a very clever idea. I’m just enjoying all the lovely detail and information about your beautiful tablescape. The fall hues are in perfect balance and the tray centers your arrangement! Just so delightful to view! What a lovely tablescape! I love the goblets, the napkins & the beautiful Fairy Tale Castle pieces. I can understand why you’re smitten with them! Beautiful tablescape Jane. I love using fresh fruit ans flowers and those colours go perfectly with your napkins and napkin holders. Your table is beautiful! Perfect for the fall transition. Very pretty Jane! I pinned some…thanks for the ideas you creative person! What a pretty table! 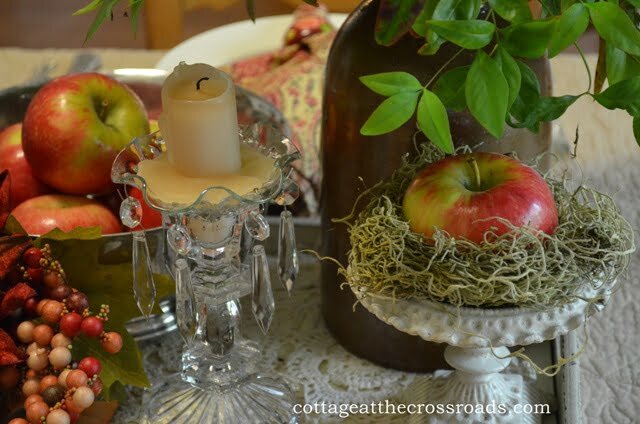 The apples make a lovely centerpiece, along with the foliage from the yard! Visiting from BNOTP. Jane…just love your harvest table…I love how you used the Nandina for the centerpiece..gorgeous!….Love the Fairy Tale Castle pieces…so beautiful…. Your table is beautiful, Jane. It inspires me to set the farmhouse table. Love your table…..I have quilt very similar on my bed in my master. I have several quilts…never thought of putting it on my table but now the wheels are turning!!! Thanks for sharing! Beautiful! What a beautiful table jane!! love the quilt idea….. I am already sitting here wondering about one of my quilts on the table!!!! LOLOL…. Autumn is truly a gorgeous time of year!!! The tablescape is beautiful. You are such a talented lady. We have a dining room table that Neal’s great-grandparents got when they married in the 1800’s. When all the leaves are in the table will seat 10. Love your table with all it’s pretty elements ! The apples nestled into the spagnum is so pretty! Hop over and link up! 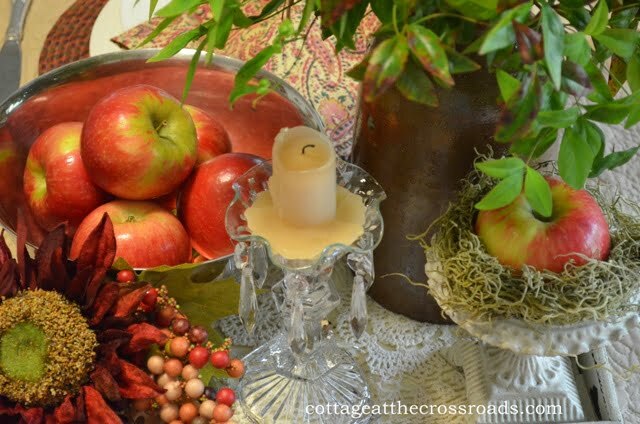 The rich, warm tones and use of apples make your wonderful tablescape a true reflection of my favorite season. 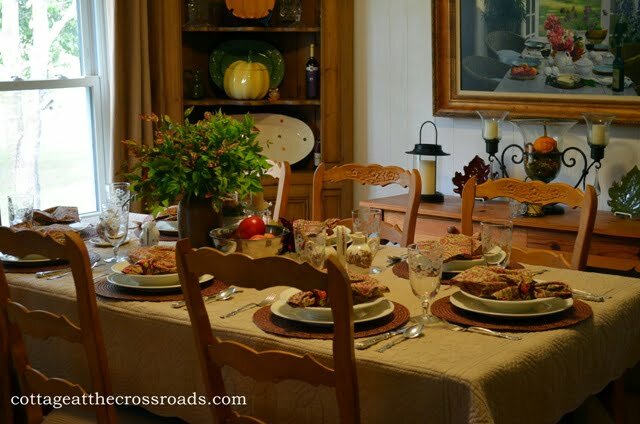 The vintage heirloom pieces from your mother-in-law and mother are not only beautiful but a sweet remembrance of people you love and give them a place at your table. 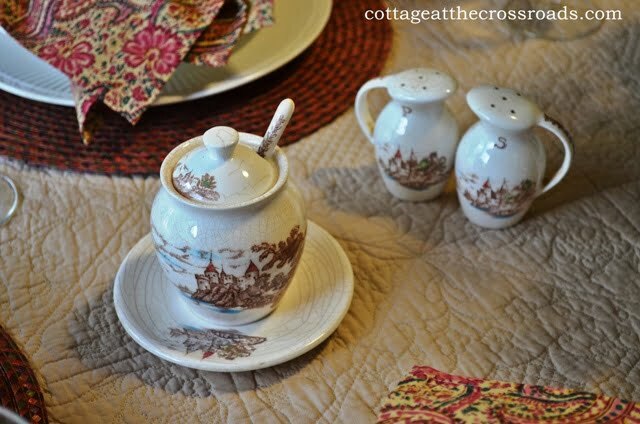 So happy you could use pieces from the Fairfield House at the Cottage at the Crossroads! 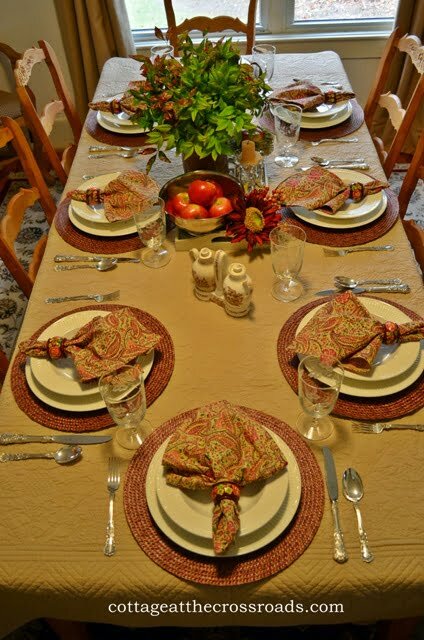 Love the tablescape, Jane. The napkins and rings are very eyecatching. The apple displayed in Spanish moss is a neat idea and the centerpiece greenery with a tinge of autumn color is perfect. Beautiful!! I love how you put everything together. I can hardly wait for the day when I have time to prettify my house. It does take time and effort. Thanks for the inspiration. Yes, fall is a beautiful time of year! Your table is lovely, love evrything about it. Easy to see why you are smitten with the Royal Vista! It is lovely, what a treasure! Your mother’s glasses are lovely, another awesome treasure! You have set a lovely table, so very inviting. It would be a treat to sit down to a table set like that!!! 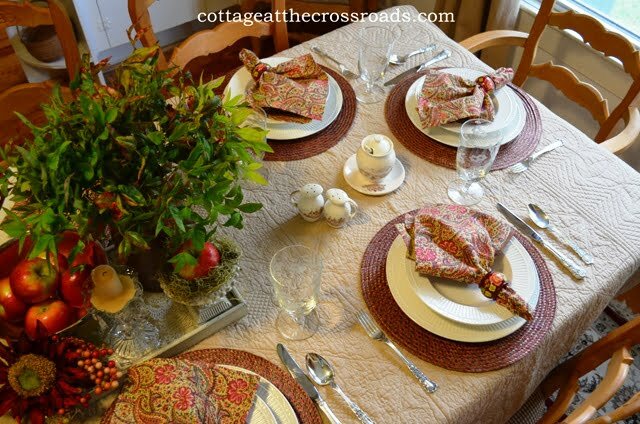 Beautiful fall table Jane! I’m a big fan of quilts on the table~ so soft and inviting and no ironing required 🙂 I adore your Fairy Tale Castle pieces~ what an appropriate name and I love the crazing on them! 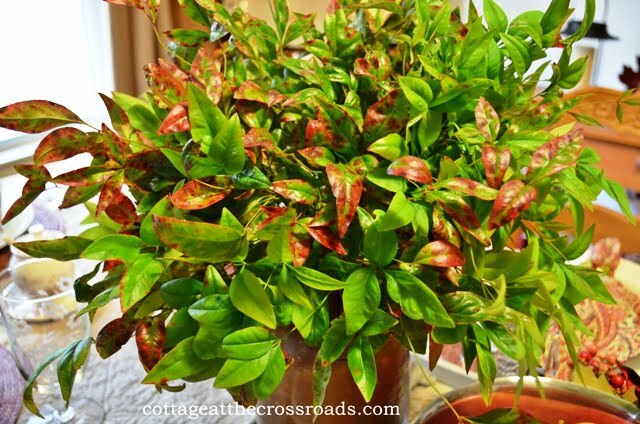 Your Nandina has a beautiful first blush of color on it! 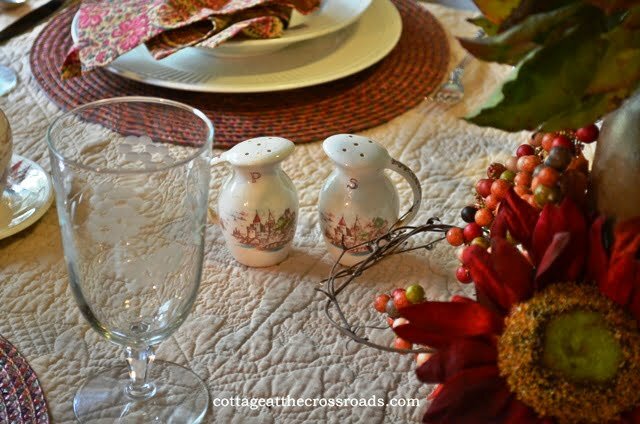 I love your fall table.That is such a sweet pattern in your mother in laws condiment set. Wonder if dishes were made in the same pattern-it would be fun to collect them if they did. I like that nandina centerpiece, I may have to try that.